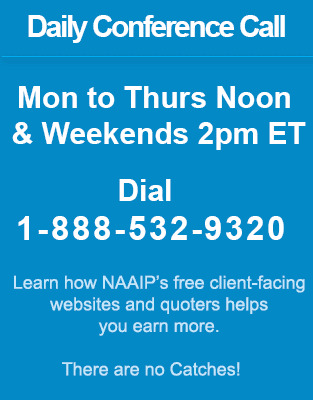 NAAIP is a Medicare Supplement IMO that offers contracts with the country’s top Medicare supplement providers. Multiple carriers in one place so that you can sell the lowest priced Medicare supplement. Our lead program is as follows: Every 10 Medicare supplement or 10 Medicare renewal Medicare Advantage sales will get you 1,000 free mailers. Every 5 new Medicare Advantage sales will get you 1,000 mailers. Click here for our certified lead vendors. NAAIP offers a wide range of tools to help you increase your sales. We offer Quotes Engines, E-Apps, Direct Mailers, Consumer Data, Dialers and Live Transfer Leads, etc. There is a wide range of Medicare supplement sales training to keep you up to speed with this ever changing industry. NAAIP agents have access to AgentXcelerator. A 100% accurate Medicicare supplement, Medicare Advantage and Medicare Part D Quote Engine. Agents are also encouraged to sign up to your NAAIP award-winning agent website (on the right side of this page on a desktop pc). At our daily conference call, we discuss putting the website on your own domain name, moving the site up in Google and Medicare supplement selling techniques. It is an open forum. United American Insurance was founded in 1947 and is an A+ rated carrier based in Mckinney, Texas. United American is a Torchmark Company. United American has been selling Medicare supplements since Medicare started. Oxford Life Insurance was founded in the Grand Canyon State of Arizona in 1965. Oxford Life is an insurance agents favorite carriers because of its cutting edge technologies and good service. Standard Life and Accident Insurance was founded in 1933 as the Hospital Service Company in Oklahoma. Aggressive expansions has made this carrier a powerhouse in 49 states. Standard Life is now part of American National Insurance Companies. Medico Insurance was founded as a health and accident insurer in 1930 and began selling Medicare supplements in 1975. Licensed in 47 states. Liberty Bankers Insurance is a Dallas, Texas based insurer that uses the latest technologies and over 8,000 agents to markets its products. Shenandoah Life Insurance Company was founded in 1916 in Roanoke, Virginia and is proud of its good service for the last 100 years. Offering Medicare supplements in 49 states. Includes contracting for Cigna Medicare Supplement Solutions, American Retirement Life Insurance Company and Loyal American. Founded in the middle of the last century by the Mennonite church. Appointing with Everence will allow you a unique approach to business that incorporates religion and community. Company has given Forethought Life Insurance Company the "Excellent (A)" rating. It has been in the insurance business since 1985 and has been offering high quality plans to customers ever since. Gerber Life Medicare Supplements have been affiliated with the Gerber Products Company ever since 1967. Gerber provides accident, life, and Medicare supplement insurance. Since the early 1990s, the Heartland National Life Insurance Company appointment is criticle to provide affordable products to customers in multiple states. Heartland is becoming increasingly popular for its Med-Sup plans. Manhattan Life has been serving the public since 1850. Manhattan Life has a comprehensive portfolio which is customized to the needs of carriers that you should consider appointing with. Mutual of Omaha offers various types of insurance and financial services to people, groups, and companies all over the U.S. Mutual of Omaha was founded in 1909. Your portfolio might seem incomplete without the Sentinel Life Medicare Supplement. Offering products to seniors, Sentinel remains a favorite for appointments due to its high compensation. Founded in San Francisco, California in 1928, TransAmerica Life is is one of the largest insurers in America and provides a variety of insurance products. UnitedHealthcare Medicare Solutions belongs to UnitedHealth Group, which is a Fortune 25 company. Offering Medicare supplement, Advantage and Part D.
Woodmen of the World/Assured Life Association was established in 1890. Consider appointing with this fraternal benefit society that offers life insurance, annuities and Medicare supplement. Combined Insurance is a worldwide provider of insurance products and part of the ACE Group. Combined Insurance was established in 1922 and it is this rich heritage lays the foundation for its continuing success. Having acquired Genworth’s Medicare supplement business for a reported $270 million, Aetna is following their rich history of offering affordable policies. Agents who appoint with Aetna will benefit from competitive rates and compensation. Private insurers sell Medigap policies to cover the ‘gaps’ in traditional Medicare Plans. Medigap policies (supplemental insurance) are health insurance plans that enable clients to subsidize health care expenses which are not covered in the basic Medicare Plan. If your client has both a Medicare plan and a Medigap policy, all their health related expenditures will be taken care of by the Medicare Plan and Medigap policy respectively. The rate of Medigap policies can differ, so it is wise to compare them. Almost all insurance companies offer the same benefits from Medigap Plan A to Plan L.
It is up to the insurance company which Medigap policies it is interested in selling. Usually, clients need to have Medicare Part A and Part B in order to purchase a Medigap policy. For Medicare Part B, monthly premiums must be paid. Those requiring extra coverage will additionally have to disburse premiums for a Medigap policy. It is recommended that spouses and domestic partners should have individual Medigap policies because a Medigap policy will not provide coverage for a partner’s healthcare expenses. people of all age groups with End-Stage Renal Disease (permanent kidney failure that needs dialysis or a kidney transplant). If a client has a Medicare Part A plan, it will take care of all the expenses whilst they are in hospital. The plan covers important hospital procedures and expert nursing services. Health related costs and hospice care are also covered under this plan. However, Medicare Part A does not cover long-term or custodial care. In order to enjoy these benefits, beneficiaries have to meet some conditions. Cost: Those who qualify for Medicare Part A have to pay monthly premiums. Often people do not have to pay premiums as a partner will have paid for it already, whilst working. In situations where clients do not have Part A Hospital Insurance, they can always purchase Part A, should they or their partner not receive Social Security. Part B of Medicare offers coverage for both doctors’ fees and outpatient care expenses. In addition, it covers those medical services which are not covered by Part A. For instance, services rendered by physical and professional therapists, various types of home care, etc, are sponsored by Medicare Part B whenever they are required. Cost: In order to receive Medicare Part B, you have to pay monthly premiums. The premiums can be higher in some instances where the beneficiary did not sign up for Part B when first eligible. Charges for the policyholders who did not enroll for Part B increase 10% every year after they first qualified for Medicare Part B. When clients sign up for Medicare Part B, they will continue paying the penalty until the time the plan is effective. In addition, beneficiaries have to shell out a Part B deductible each year, before Medicare will pay its contribution. In order to pay the premiums and deductibles, beneficiaries can seek funds from their state. At the onset of every year, Medicare deductibles and premium amounts can vary. For this coverage, the majority of individuals pay premiums on a monthly basis. From January 1, 2006, Medicare Prescription Drug Coverage nas been offered by private insurance companies to all Medicare beneficiaries. Prescription drug expenses may decrease with the help of this insurance coverage. Persons can select a drug plan of their choice to suit their needs. Should you do not sign up for Prescription Drug Coverage when you are first eligible, you may have to pay a penalty if you decide to enroll yourself at a later stage.